You are currently browsing the archives for the “Writing Popular Fiction” tag. The Context SF Convention in Worthington, Ohio, continues to impress me as one of the best regional cons in the country. With a strong writing track and lively panel discussions. I go whenever I can, and this weekend I’ll be on hand for a number of events. First up will be the panel “What is an MFA and (Why) Do I Want One?” (Friday @ 7:00 pm). 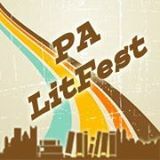 Here I’ll be joining Lucy Snyder and Tim Waggoner — fellow residency faculty from Seton Hill University’s MFA program in Writing Popular Fiction. It should be a lively discussion. 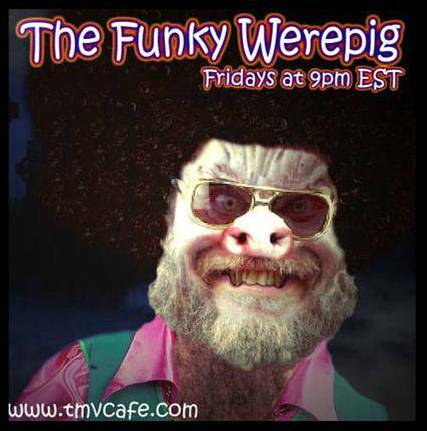 Saturday will be a busy day, staring with “Wellness For Authors and Readers” at 10:00 am and continuing until a grand finale at 7:00 pm, where I’m scheduled to give a reading at The Beatnik Cafe before rushing off at 7:30 to join Greg Hall on a special podcast of The Funkey Werepig Show. 7:00 pm – What is an MFA and Do I Want One? Among the publishers and organizations attending Context this year will be Alliteration Ink, Apex Books, Loconeal Publishing, Seventh Star Press, and Blackwyrm Publishing. 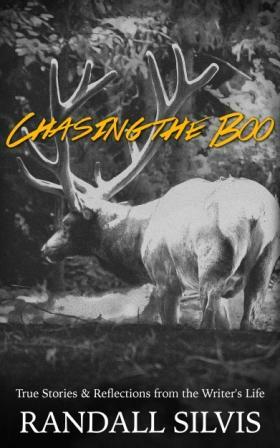 Attending pros will include Brady Allen, Jarod K. Anderson, Leslie Anderson, Matt Betts,Diana Botsford, Gary A. Braunbeck, Maurice Broaddus, Carrie Cuinn, Nicole Cushing, David L. Day, Geoffrey Girard, Sarah Hans, Janet Harriett,Rosemary Laurey, Laura Resnick, Linda Robertson, Daniel Robichaud, Steven Saus,Sharon Short, Jason Sizemore, Lucy A. Snyder, Ferrett Steinmetz, Michael West, and Tim Waggoner. Michael A. Arnzen’s website Gorelets.com is always brimming with terrific writing advice. That’s not surprise, given that Mike is both a founder of Seton Hill University’s graduate program in Writing Popular Fiction and the author of the book Instigation: Creative Prompts on the Dark Side. 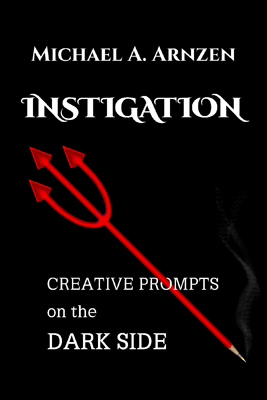 Instigation is a treasury of over 500 tips, scenarios and sparks to help ignite the fuel in your creative furnace. Its aim? To push you into the danger zone of your imagination by thinking in unconventional ways and trying things you never thought — or dared — to try before in your writing, art, or dreams. You can see what kind of writing advice I have to offer by checking out Gorelets.com. Click on over . . . I’ll meet you on the other side. Cover art for Michael A. Arnzen’s Instigation. The first in a series of profiles on some of the writers being featured at this month’s Writers on Writing @ Riley’s. Hailed as “a masterful storyteller” by the New York Times Book Review, Randall Silvis is the author of fourteen critically acclaimed books of fiction and nonfiction in various genres. In addition to his numerous works of fiction, Randall is the author of several books about writing and the writing life: Chasing the Boo, True Stories & Reflections from the Writer’s Life, What I Know, More True Stories & Reflections from the Writer’s Life, and 10 Easy Steps To Becoming A Writer, And Other True Stories of the Writing Life. He is also one of the contributors to Many Genres One Craft: Lessons in Writing Popular Fiction and a residency writer at Seton Hill University’s graduate program on Writing Popular Fiction. 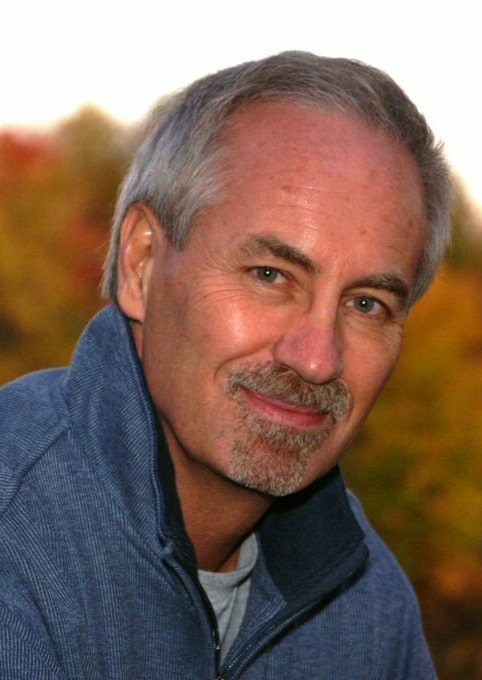 In the weeks ahead, he will be appearing at the Pennsylvania LitFest and the In Your Write Mind Workshops, but you can catch him first on May 27 at Riley’s Pour House where he will be presenting a memoir in doggerel titled “Requiem.” Not to be missed. The evening kicks off at 8:00 PM at Riley’s Pour House, 215 East Main Street, Carnegie, PA 15106. There’s no cover. Come early, meet the writers, and get ready to experience the art of story from some of the contemporary masters of the craft. Look for more author profiles soon, and, if you find yourself sharing my excitement for this event, be sure to circle May 27 on your calendar. When the scops descend on Riley’s, you’ll want to be there. Bram Stoker Award finalist Lawrence C. Connolly (the 21st-Century Scop) is the author of the Veins Cycle books, the first of which, Veins (2008), has just been released for the first time in a special Kindle edition (complete with the original illustrations) from Fantasist Enterprises. The third book in the series, Vortex, (with illustrations by Rhonda Libbey) will debut in print and ebook on July 1. Imagine 50,000 people packed into a single indoor space. Now add a 20-foot tall Cthulhu (made entirely of balloons), a Stay Puft Marshmallow Man (in a top hat, no less), armies of warriors and monsters, and a roster of top sf and fantasy writers. Yes, it got crowded. But that’s GenCon. Never mind that the Indiana Convention Center provides 500,000 square feet of sprawling indoor space. There were still times when I found it impossible to walk without bumping into someone or something. And did I mention that there was also a motorcycle convention in town. Yeah, you can’t make this stuff up. I can only imagine what it must have seemed like to the residents of Indianapolis, seeing their city overrun with bikers and mythological beasts (there’s a high-concept Hollywood film in there somewhere). Indeed, it must have seemed as if a trans-dimensional portal had opened. I was in town as part of the GenCon Writer’s Symposium, a large writing convention that coexists within the sprawling wonder of GenCon. Its panels, readings, and workshops often attract standing-room crowds, and the attending writers provide a fine cross-section of the field. The Symposium kicked off with a Wednesday dinner, where I shared a table with writer Brandie Tarvin, editor W. H. Horner, and up-and-coming novelists Jeffery Brooks and Matthew O’Dwyer (both MFA candidates at Seton Hill University). 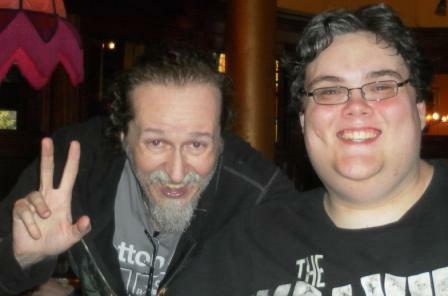 Along the way, we were joined by Larry Dixon, who contributed to the digital effects on Lord of the Rings and collaborated with his wife Mercedes Lackey on a number of terrific fantasy novels. The next morning W. H. Horner and I launched Fiction Fundamentals, three days of workshops covering the essentials of genre writing. 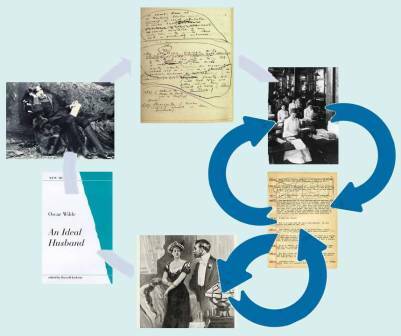 The sessions explored writing as a process rather than a product, looking at how the experience of reading a novel (moving page-by-page from beginning to the conclusion) has little in common with the act of writing one. The graphic on the left illustrates this difference, showing how the manuscript for one of Oscar Wilde’s plays progressed circuitously from concept to finished work – passing through a series of handwritten and typing-pool drafts along the way. I also did a couple of readings, one featuring selections from Visions and This Way to Egress, the other centering on an abridged version of “The Fourth Sign” from Paul Genesse’s The Crimson Pact. I did both readings from memory, a form of delivery that harkens back to the roots of storytelling (think Homer or the Beowulf poet). I particularly enjoyed presenting “The Fourth Sign.” It’s a rather subversive story, one that gradually removes the wall between reader and story. It opens with a few references to the reader’s world and builds from there, drawing the reader in until it becomes clear that he or she has been a character in the story all along, and that the act of reading the story (or attending the reading) is actually the story itself. It was fun watching the audience as they sensed everything coming together, and having the story memorized helped me keep the performance in synch with their dawning realizations. 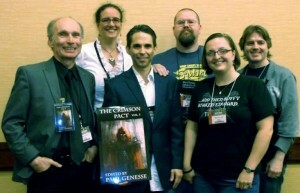 You can read Paul Genesse review of the reading (and the convention) at his blog. I also took part in panels on Steampunk (where Jennifer Brozek, Paul Genesse, and Sara Hans talked about ways in which Victorian-age science fiction can reflect 21st-century inclusivity) and Hard SF (where Wesley Chu and Jason Sanford urged beginning writers not to get bogged down doing research). I may go into more detail on these topics in future blogs, but right now I sense the portal is closing. I need to get out while I can. Till next time, I’ll see you between the pages. GenCon Crowd by Mike Olson Spirit of the Blank. Larry Dixon and Matt O’Dwyer by Lawrence C. Connolly. The Writing Process According to Oscar Wilde by Lawrence C. Connolly. Lawrence C. Connolly, Karen Bovenmyer, Paul Genesse, Patrick Tracy, Stephanie M. Lorée, and George Strayton at the Crimson Pact reading. Photo by Tammy Lyn Genesse. Powered by WordPress and delivered in 0.325 seconds using 45 queries.